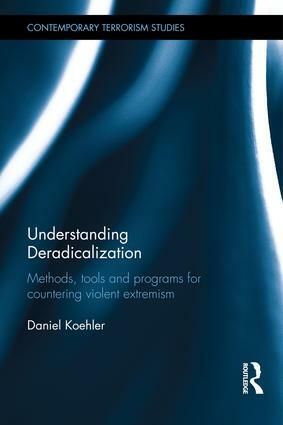 Published in November 2016 Understanding Deradicalization: Methods, Tools and Programs for Countering Violent Extremism provides a comprehensive guide to the different aspects of deradicalization theories, programs and methods. It analyzes the practical and theoretical aspects of deradicalization programs and the methods being employed to bring extremists and terrorist back to a non-violent life. The book includes in-depth case studies on programs and former extremists, including interviews with former German neo-Nazis and families of Jihadists who have received deradicalization counselling. Using a coherent theory of radicalization and deradicalization, it integrates existing programs into a typology and methodology regarding the effects and concepts behind deradicalization. In addition, a current state of the art assessment of deradicalization programs around the world provides a collection of programs and landscapes worldwide. It thereby functions as a unique guide for practitioners and policymakers in need of evaluation or construction of such programs, as well as a resource pool for academics interested in research about deradicalization programs and processes. The major aim of this book is to consolidate the existing scholarship on deradicalization and to move the field forward by proposing a coherent theory of deradicalization, including ways to measure effectiveness, standard methods and procedures, different actors of such programs and cooperation on national and international level. In essence, this work enables the reader to identify how, when and why deradicalization programs work, how they can be built and structured, and to identify their limitations. You can order a copy here or by clicking on the cover below. ‘Koehler’s book is the most methodologically rigorous, theoretically-informed, and comprehensive on this topic, to date. He brings immense depth of both experience and scholarship to this important volume.